Ready to root for some fast paced, exciting Chicago football? Get ready for the Chicago Slaughter! 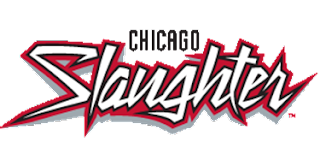 Chicago Slaughter play for the Indoor Football Team, the world's largest indoor football league. The team is owned by Jim McMahon and is coached by Steve "Mongo" McMichael.These former Chicago Bear legends bring notoriety to the franchise. Indoor football is fast paced action. It's played on a 50 yard field and scoring opportunities are abundant. Plus, you don't have to worry about the unpredictable weather conditions. Every home game is played at the Sears Centre in Hoffman Estates. Right now, the Chicago Slaugther are offering an amazing season package deal just in time for the holidays. Check out the offer. What do you get as a season ticket holder? Same Great Seats for Every Action-Packed Game! $10 Slaughter Merchandise Card (one per order) PLUS 10% Merchandise Discount! Exclusive Season Ticket Holder Season-End Party & Special Season Ticket Holder Contests & Giveaways! Exclusive Merchant Discounts for Season Ticket Holders! Those other Chicago football teams don't give you all of these benefits at such a great price. To place your order, call a Slaughter Sales Representative at 647-310-3190 or tickets@chicagoslaugther.com. This holiday season give the gift that everyone will love, season tickets to the Chicago Slaughter.